In an elementary muscular effort, the maximum power is obtained for a specific force and speed, generally close to 40% of the maximum force and speed (Ref.). In an effort with agonist and antagonist muscle groups, the set of multiple biomechanical constraints defines the optimal functioning. For a cyclist, this phenomenon is translated by a force on pedals and a particular pedaling frequency (cadence). As the crank length is fixed, only the pedaling force and the cadence (which defines the angular speed) fluctuates, and consequently, the product of these two elements must be maximum. This maximum is not obtained in extreme cases because when force is at max, the cadence is at min, and at the opposite, when the cadence is at max, the force is at min. It is obtained into a relatively narrow frequency range. This range depends more on the level of the sportsman than his experiment. A study even showed that high level runners not doing cycling, pedal naturally in the same cadences as the high level cyclists. Furthermore, when analyzing in detail one rotation of cranks, the force applied on pedals is not constant, it is minimum when cranks are vertical, which requires more energy in slow rotations. So, in equal produced powers, the cyclists pedaling more slowly consume generally more glycogen which potentially decrease their endurance. This ensues that it's better to pedal between 80 and 100 rpm to be more efficient. More exactly, the best cadence is between 80 and 90 rpm on climbing roads, 90 and 100 rpm on flat roads. Almost all world records of hour for example, were realized around the 100 rpm. For the stand up position used in climbing, the body movements require an extra energy due to the movement of the body gravity centre. In this case, the cadence must be lower, between 70 and 80 rpm. 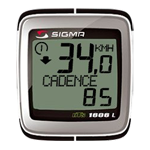 Without frequency monitor, it is possible to calculate the cadence from the speed (Ref.). Attention ! Do not confuse the previous cadences with some higher cadences obtained on track because of unique gear ratio.